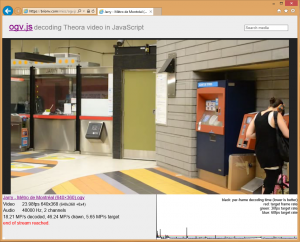 ogv.js now with sound in Internet Explorer thanks to… Flash? Mostly this means Internet Explorer and Safari — Chrome and Firefox handle the files natively. However Internet Explorer was limited by the lack of support for the Web Audio API, so could not play any sound. I’d hypothesized that a Flash shim could be used — Windows 8 ships with the Flash plugin by default and it’s widely installed on Windows 7 — but had no idea where to start. One of the old maintainers of the Cortado applet, maikmerten, took an interest. After some brief fixes to get the build scripts working on Ubuntu, he scrounged up a simple ActionScript audio shim, with source and .swf output, and rigged up the ogv.js player to output audio through that if there was no native Web Audio API. It even works on Windows RT, the limited ARM version of Windows 8 — though the video decoding is much too slow on a first-gen Surface tablet’s Tegra 3 CPU, audio-only files play nicely.